The Hoos finished the season 31-2, while playing in the ACC. They lost just twice, at West Virginia, in one of the sport’s most hostile environments, and at home versus rival Virginia Tech. The Cavaliers shot 11 for 38 from outside the arc in the game, and still were able to force overtime by only turning the ball over four times and playing their otherwordly level defense. Virginia’s defense is not just good. The Hoos defense has been transcendent. Kentucky in 2015 was one of the greatest college basketball teams to not win the title, thanks to Bo Ryan and the Wisconsin Badgers. The 2009 Memphis team couldn’t score and that caught up to them, in a 102-91 loss to Missouri in the Regional Semifinal. That Louisville team played an entirely different brand of defense from Virginia, focusing on pressure and turnovers, rather than packing the lane, yet those Cardinals might be the best parallel for Tony Bennett’s team this season. Louisville’s offense was shaky that season, with their efficiency number even lower entering the tournament. Russ Smith made every shot in the book that March and the rest is history. If Kyle Guy, Ty Jerome, or Devon Hall catch fire this month, or even if they take turns with the hot hand, Virginia will cut down the nets in San Antonio. Losing super sixth man De’Andre Hunter to a broken wrist is a very bad break for Virginia. Even without him, the Hoos are a forced to be reckoned with. While the Wildcats have been getting chased by federal agents, they have also been playing some fantastic basketball under the radar. 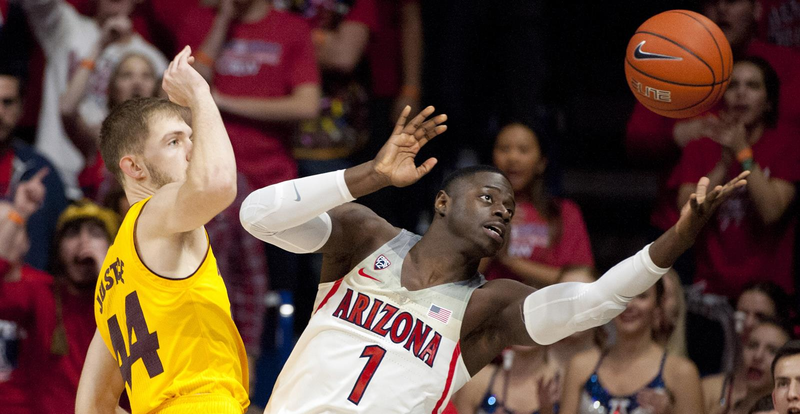 You may have been fast asleep when Arizona won both the Pac-12 regular season and tournament titles, behind one of the most talented starting lineups in college basketball. Since starting the season just 3-3 following a disaster three loss performance at the Battle 4 Atlantis tournament, Arizona is 24-4. Deandre Ayton is the best big man in college basketball since Anthony Davis (more on him in a moment). Allonzo Trier is a potent scorer, capable of dropping 25 every game in the tournament. Rawle Alkins is an overqualified glue guy and Parker Jackson-Cartwright is a senior point guard. This isn’t just your normal four seed. Arizona is a sleeping giant, with no limit to what it can accomplish. For those of you out there who like Virginia, but can’t commit to the Hoos for some reason, may I introduce you to Diet Virginia. Cincinnati thrives on the defensive side of the ball, turning basketball games into hour long wrestling matches. Remember that stat about Virginia’s sub-85 adjusted defensive efficiency rating I went on and on about a few paragraphs ago? Cincinnati is second in the nation in that metric, allowing 86.2 points per 100 possession (adjusted for opponent). The Bearcats and Cavaliers are basically in their own galaxy this season defensively. The difference between second place Cincinnati (86.2) and third place Texas Tech (92.1) is the same as the gap between third place Texas Tech and 49th place DePaul (98.0). If those numbers went over your head, just let me assure you, Virginia and Cincinnati are playing the best defense in college basketball by a wide, wide margin. I apologize for turning Cincinnati’s section here into a second Virginia section, but can you blame me? 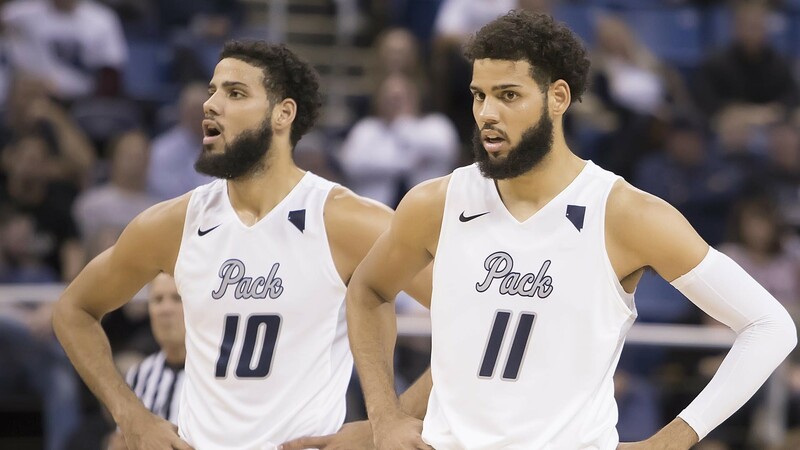 Caleb and his twin brother Cody transferred from North Carolina State to Nevada, seemingly because they only felt comfortable playing for a team named the Wolf Pack. Caleb averages 19.1 points per game and Cody pitches in 13.6 of his own. I have a theory as to why Caleb scores more than his brother. Caleb shot 41 percent on 218 attempts from 3-point land this season. Cody tried just 47 threes this season and made under 30 percent. How many times per game do you think the defense forgot which twin is the one who can shoot? I’m willing to bet that happens at least twice a game, hence the six point difference. I’m also willing to be the Martin twins have heard this a million times and I’ll concede that Caleb probably scores more simply because he can shoot, but Cody can’t. Even so, the Twin Theory is worth considering. Ayton is one of the top two prospects in June’s NBA Draft, along with European do-everything-guy Luka Doncic. The Bahamas-born big man has been unstoppable for Arizona. His ceiling is absolutely sky high. Right now, the best comparison for Ayton would be “Shaq with a jump shot.” That may not even go far enough, since Ayton already has more muscle definition and a softer touch than we ever saw from a young Shaq. That’s Ayton’s ceiling and he has a high floor too. Right now, his biggest problems are on the defensive end. Most of his lapses in that regard look to be mental, with less then perfect effort to blame more than his athletic tools or lack of instincts. As far as this tournament is concerned, he is fully capable of dominating like Godzilla tearing through an unfortunate city. There are so few college bigs able to battle with Ayton, even fewer situated near the Wildcats in the bracket. Virginia’s 6-foot-10 center Jack Salt will be tested, if the two teams match-up in the Sweet Sixteen. Bamba won’t need to wait long after Ayton’s name is called at the draft to hear Adam Silver call his name as well. The freshman center is built like a stretchy Marvel superhero, or better yet, a Golden Ticket winner who suffered an unfortunate accident in the licorice room of Willy Wonka’s factory. Bamba’s arms extend nearly to the rim and his vertical leap makes shooting anywhere near him a bad idea. He averaged 3.7 blocks per game (4.8 per 40 minutes!!) and posted the 7th best block rate in the nation. Bamba records a block on 13 percent of opposing players’ field goal attempts when he’s on the floor. The amount of shots he alters or scares away can barely be counted. The Canes have been a relative disappointment this season, with hopes high in Coral Gables before the season began. Miami coasted through a bakery’s worth of cupcakes in the nonconference schedule before an uneven performance in ACC play. The Hurricanes mix of upperclassmen and freshman stars never quite clicked to the level people expected. They meet a Loyola team that looks like it was cast by a Hollywood director for the role of a Cinderella story. Their best player is a 6-foot-1, 185 pound scrappy point guard named Clayton Custer. That’s a Friday Night Lights character name in real life, winning Missouri Valley Conference Player of the Year. Custer is Steve Nash in slow motion, leading a patient Ramblers offense that grinds out every possession until they find the shot they want. They find that shot all the time, with the 8th best effective field goal percentage in college basketball. 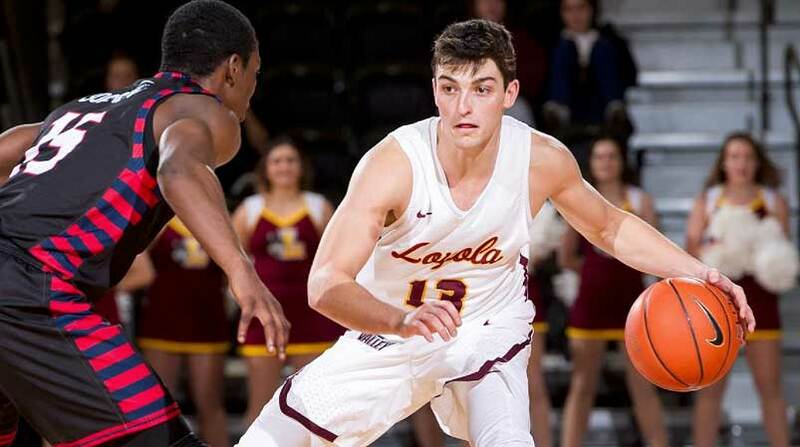 Every Rambler who has attempted at least 50 threes this season has made at least 38 percent of his attempts. This team can beat Miami (and more…). This game is a clash of styles in the worst way. Kentucky loves to spread the floor, isolate defenders, and attack on the dribble. Every single player who sees minutes for the Cats is a sophomore or younger. Davidson is led by a senior who scores 21.8 points per game. The Wildcats (well, the Davidson Wildcats….both teams are Wildcats) run one of the most effective motion offenses in the nation. Bob McKillop’s players read-and-react to what the defense gives them, leading to oodles of backdoor layups and open three pointers. In fact, in the Atlantic 10 Tournament semifinals, Davidson took 14 threes in the first 13 minutes of game time before attempting a shot inside the arc. Will John Calipari’s young team defend non-stop action for the entirety of the shot clock? I’m willing to bet Davidson gets enough open shots to keep this close or steal a win. Most of these games don’t just have one thing to key on, but boy does this match-up have something special. Creighton’s leading scorer Marcus Foster burst on the scene as a freshman, averaging 15.5 points per game, at Kansas State. As a sophomore his points, minutes, and field goal percentages all dipped. He was benched, suspended, then asked to leave the Wildcats program. Things have supposedly gone smoother at Creighton, leading to the match-up you’d have to assume Foster has been waiting for. The coach who kicked him off the team, Bruce Weber, is still at Kansas State and just as eager to win this game as Foster. There’s a few ways to feel about this whole situation. It could be the motivation Foster needs and lead the Bluejays to a victory. It could also get in Foster’s head. He’s a volume shooter, placing in the top three of his conference in percentage of shots taken when on the floor all four years of his career. My bet is that Foster forces the issue one too many times and stalls the Creighton offense, allowing Kansas State to sneak into the next round of play. Basketball is no longer a game ….but a ridiculous 3 point shootout contest… where …. a 16th seeding team shooting them at 50% ( Umbc/ Buffalo) will always outlast any better seeded team (Virginia/Arizona ) shooting them at only 18 & 11% . UMBC took 24 of them out of a total of 48 shots taken . While Buffalo made 30 of them out of the 62 shots taken . Sure they go for the 2 pointers when it is there , but the strategy is to drive the lane , draw the defense ,and kick it out back to the open 3 point look . The lesson to be learned for coaches is to recruit 3 point shooters because under this stupid rule they have become easier to make including the contested ones (much more with the step back) than to try score around the rim where many shots get blocked . When you start to give bonus points for selected shots, players will focus on them in practice and get progressively better at it. That’s what has happened! you can push the line back as far as it can, the same scenario will happen! It is also a stupid rule because why should a shot taken 1/6 of an inch behind the arc worth 3 points while the one with a foot on the line only worth 2 points? It is amazing to me that the big basketball pundits do not see this , question it, or criticize it! The only 3 points that make sense is when you are fouled in the active shooting and score, where 3 points should automatically be given instead of having to shoot a free throw after. If you like that rule, then why bother playing 40 minutes, as well make it a pure 3 or more pointers contest, by adding a point for each shot made further and further. Rules are fine as long as they make sense within the context of a game , but 3 points for as shot made beyond that arc no longer does ! Why would you give an adding bonus point for a shot that has become almost automatic like a layup especially the wide open ones for a growing of players taking them , while only giving 2 points when you score in the tight space underneath the basket which is much more difficult to make with the big men presence blocking many of them.? The national average on 3-pointers was 35 percent. Far from automatic. If it was just a layup, what happened to UVA, UNC, and MSU this weekend? When you are physically and mentally tired you miss in the same manner shots are missed from 18 15,10, 5 feet including also layups rolling off the rim. Right. So…why does it matter where the shots are coming from? Feels like you’re arguing against yourself. If you aren’t a fan of the 3-point shot, well I’m not sure what to tell you. It’s as much a part of the game as any other rule at this point. Without it, the style of play would be brutal to watch. The 3 incentives spreading out and shooting somewhere besides the lane. They spread the floor before that rule with only 2 points and nothing would prevent them to do it without the 3 points. The main issue here is that basketball is less and less of a game but more and more a ridiculous 3 points shooting contest! Why would it otherwise when they are easier to make than trying for 2 points under the basket and have your shot block which is almost impossible with the 3’s short of fouling. Because of that rule I have (like many other people I spoke too ) progressively lost interest in what’s left of the game. I have not even watch a single Tournament game. All the Basketball pundits I have contacted in my area all agree with my analysis , but they are paid to go with the flow and not criticize , like the fans do not care about how their team won as long as they did. And when they do : its WE won! But if the team loses its THEY lost! The 3 point was implemented to offset the big men advantage in the paint especially around the rim, when all what was needed and is needed to lessen it , was ….and is… to make that paint progressively wider in the shape of champagne cork once the bottle is open :(ie) draw the lines diagonally from both tip end of the foul line to make that paint the widest along the baseline by about 6 feet. If you think teams were spreading the floor before the 3-point line, I’m not sure you remember correctly. Check out a game, even from the late 80’s when they were still getting use to the 3-point line, next time it runs on NBATV. The Celtics and Lakers both had 3 guys in the lane. I fully understand how great those players and teams were, but stylistically, those games are brutal compared to today’s standard. I did not and do not watch the NBA circus but I clearly remember players at UCLA like Brad Holland Charles Rochelin at UCLA taking shots from what is today the 3 point line or beyond . Regarding the average of 35% of 3 points shot made nationally (What is that % for the open looks ones which have becomes almost automatic) as well as the % for shots taken and made from around 18,15, 10 and 5 feet for example? I am not only against rules that make sense but I am against the ones that do not like also allowing the ball carrier trapped to call time out . It penalizes the well played defense. Under the current 3 point rules give an automatic 3 points three throws shot if the ball carrier is fouled preventing him taking the 3 point shot that could tie or put that team ahead in the final seconds of the game.